Boil all veggies just for 3-4 min. Or microwave on high power for 3 min. with 2 tbsp water. Allow it to cool. keep it aside. Heat oil in tawa, add cumin seeds, after it crackles, add garlic, after it becomes golden in colour add onion and tomato. Mix well. Slightly crush the onion and tomato with the spoon and cook for 3-4 min. Then add all vegetables, mix well and sauté for 3 to 4 minutes. Then add turmeric powder, pav bhaji masala, red chili powder and salt mix well. (remember you have already added salt to rice). Saute for 2 min. 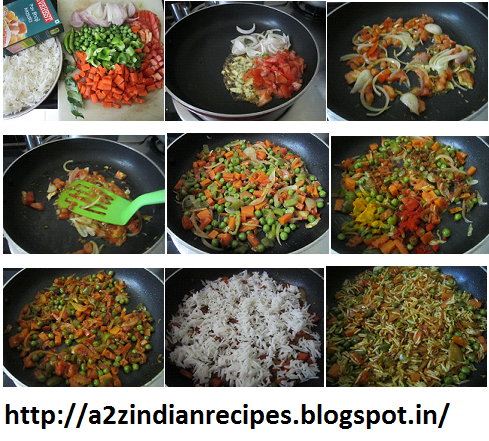 Then spread masala all over the tawa, on top of it spread rice, then mix well and sauté for 4 to 5 minutes. Then add melted butter and sprinkle lemon juice, mix well and serve hot with cucumber raita.